Robert E. Lee is well known as a Confederate general and as an educator later in life, but most people are exposed to the same handful of images of one of America's most famous sons. Unfortunately, due to sales rights restrictions, we cannot offer Robert E. Lee in War and Peace for sale in your country. Robert E. Lee is well known as a Confederate general and as an educator later in life, but most people are exposed to the same handful of images of one of America's most famous sons. 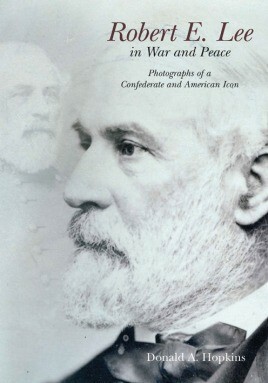 It has been almost seven decades since anyone has attempted a serious study of Lee in photographs, and with Don Hopkins's painstakingly researched and lavishly illustrated Robert E. Lee in War and Peace, the wait is finally over. Dr. Hopkins, a Mississippi surgeon and lifelong student of the Civil War and Southern history with a recent interest in 19th Century photography, scoured manuscript repositories and private collections across the country to locate every known Lee image (61 in all) in existence today. The detailed text accompanying these images provides a sweeping history of Lee's life and a compelling discussion of antique photography, with biographical sketches of all of Lee's known photographers. Hopkins offers a substantial amount of previously unknown information about these images, how each came to be, and the mistakes in fact and attribution other authors and writers have made describing photographs of Lee to the reading public. Many of the images in this book are being published for the first time. In addition to several rare photographs uncovered during the research phase of Robert E. Lee in War and Peace, the author offers—for the first time—definitive and conclusive attribution of the identity of the photographer of the well known Lee"in the field” images, and reproduces a startling imperial-size photograph of Lee made by Alexander Gardner of Washington, D.C. Other portraits previously attributed to Michael Miley of Lexington, Virginia, are shown to be instead the product of Charles Rees of Richmond.